As an Ebook Central customer, you already have access to tools that can improve your library's ebook program and engage your patrons. But you may not be using them to their full capacity — so we've developed a webinar series to help. Each month, we'll present a different topic that will help make the most out of the Ebook Central platform you've invested in. You can attend these webinars live or listen to them on-demand at your convenience. Learn how to use the most informative report in LibCentral, Ebook Central’s administrative portal. 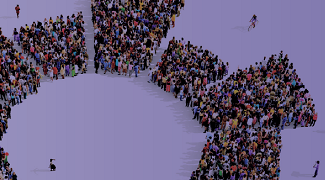 The title report is powerful, beneficial and simple for libraries who need data to make important decisions on acquisition models, upgrades and more. Digital Rights Management (DRM)-free ebooks offer the freedom to let patrons access content on their own terms. But are DRM-free titles used more than their DRM-enabled counterparts? 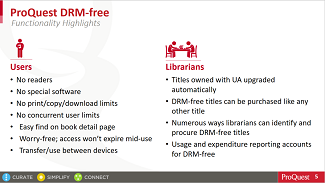 And are libraries making sound investments by seeking out DRM-free content? We’ll show you the data. The question for librarians has shifted from “Should I use demand-driven acquisition?” to “Who should I use for my DDA program?” DDA is available from so many vendors, each with subtle differences in their offerings – and those nuances can make all the difference for a successful, sustainable DDA program. Make sure your patrons know about the resources you’ve invested in! See our wealth of digital and print resources to help promote Ebook Central and other key products at your library. A simple setting in LibCentral will have a huge impact on your patrons – with little impact on your budget. Enabling extended access will help fulfill your mission of “access for all” while alleviating the fear that removing turnaways will smash your library’s ebook budget. 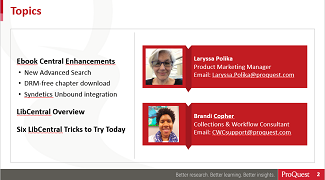 Covering the basics, we'll show you an overview of recent enhancements, demonstrate the new integration with Syndetics Unbound, and provide an introduction to the LibCentral Administrative portal. Don't forget to check out the Related Resources on Patron Analytics, Extended Access and LibCentral - download them on this page! 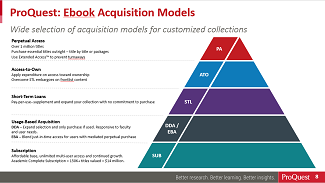 Get a primer on Ebook Central's acquisition models — and how they work together to optimize your budget, streamline your workflow, and meet your library's collection development goals. 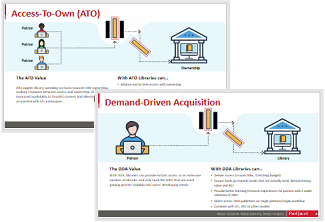 Get an in-depth look into two popular usage-based acquisition models: Demand-Driven Acquisition (DDA) and Access-to-Own (ATO). Learn how to work with your ProQuest Collections Workflow Consultant to set up your profile so you can acquire books that your patrons need, and get tips on maximizing title availability while making the most of your budget. 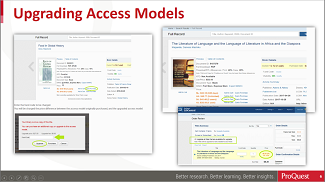 Learn how to set the access permissions that work best for your library and your budget. We'll discuss how to set the number of users and levels of access, mediation, extended access, DRM-free unlimited access titles and more. DRM-free content is available on Ebook Central and it provides an unlimited, friction-free experience for your users. 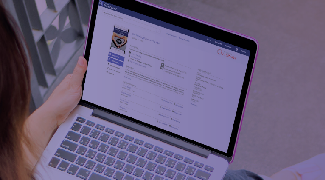 Learn more about ProQuest's selection of DRM-free titles, and how they'll improve usability for your patrons. Enhance discovery with MARC records. Understand how to find them, how to use them, and get tips and tricks on using LibCentral to manage your MARC records. 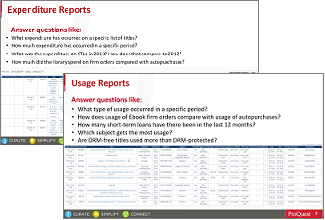 Did you know LibCentral has the best reporting capabilities in the market? See what data you can collect — including usage, expenditure and patron analytics. We put the tools in your hands to get insights into what your patrons need. 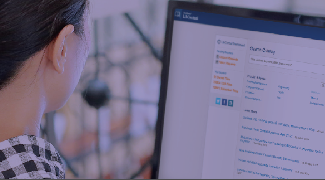 Download our recently updated datasheets for additional information on getting the most from LibCentral, Patron Analytics, and Extended Access. Also visit our full website to learn more about Ebook Central.